Readers of nVa will remember my particular dislike for Mukesh Ambani’s behemoth Tower of Babel coming up in Mumbai. However as an architect, I am also interested in the architectural aspect, besides the socio-cultural and economic implications. So here is an interesting article in the Architectural Record about the house. Construction is underway, albeit with some delays, on one of India’s highest profile and most opulent projects–the Antilia, a 490-foot-tall corporate meeting facility and private residence in Mumbai. Chicago-based Perkins + Will designed the 24-story tower for business tycoon Mukesh Ambani, whose family will occupy roughly 35,000 square feet in its top floors. Perkins + Will designed Antilia, a 24-story corporate meeting facility and private residence, now under construction in Mumbai (top). 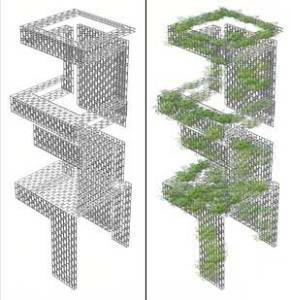 The tower features several garden levels and a trellis, which supports panels of hydroponically grown plans, that act like a green band weaving in and out of the building to demarcate different program elements (middle). A large garden occupying a floor near the tower’s mid-section will separate the corporate meeting facility and parking levels from residential space above. (above). It seems fitting that for a building named after a mythical island, rumors have swirled about the exact program of Antilia since a local newspaper first published renderings of it earlier this year. Ambani, who is chairman of the petro-giant Reliance Industries, has a net worth estimated at more than $21 billion. Some accounts falsely reported that the tower will rise 60 stories and that the Ambani family would occupy all of it. Among its interesting elements, Antilia will feature a band of vertical and horizontal gardens that demarcates the tower’s different program elements. 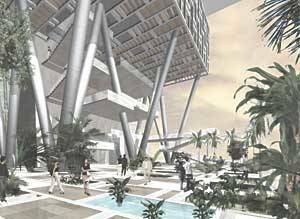 A garden level will separate the ground-floor parking and conference center from residential space above, for instance, and the outer walls on certain levels will be sheltered by trellises supporting panels that contain hydroponically grown plants. Antilia’s roots also draw on the traditional Indian concept of Vaastu. Similar to Feng Shui, the practice orients a building in harmony with energy flows. At Antilia, the overall plan is based on the square, which is Vaastu’s basic geometric unit, and a garden level occupies the tower’s midsection, the point where all energies converge according to the Vaastu Purusha Mandala. 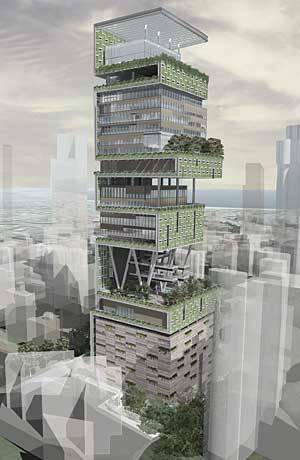 Perkins + Will won the commission for Antilia in 2004, besting Foster + Partners, SITE, Wilkinson & Eye, and Ken Yang. The building occupies a one-acre site on Altamount Road, where real estate prices top $1,000 per-square-foot. Construction had reached Antilia’s mid-section garden, but was halted this summer after a land dispute. Although the delay is expected to be temporary, many Indians nevertheless feel that the residence flaunts the country’s socialist sensitivities–and that it is excessive and ostentatious given that more than 65 percent of Mumbai’s 18 million residents live in tenements. What will Mukesh and his family do with 35,000 frikkin sq.ft?